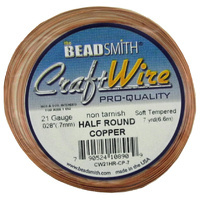 This is a type of solid wire which is used for wire-wrapping, jump rings, and coiled wire beads. It's usually made from a base of copper or aluminium with a coloured coating. 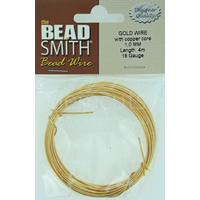 The coatings can be silver tone, gold tone, or a variety of other colours. 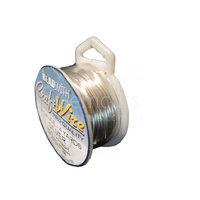 The coating on most of those wires is a bit more delicate than the plating on gold-plate or silver-plate wire. Hammering and handling with pliers must be done carefully so that the coating isn't damaged. The thickness of craft wire is measured by gauge, the same as solid wire. 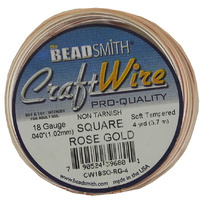 Of course, the larger the gauge (the smaller the number), the more difficult it becomes to work with the wire because of its thickness. 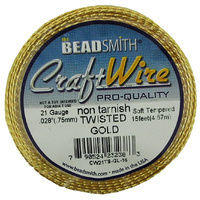 Typically craft wire does not come in different tempers. It's usually somewhere between dead-soft and half-hard, but closer to dead-soft. 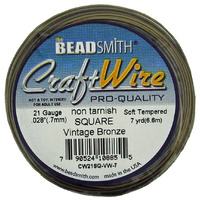 Craft wire will work harden with bending and hammering. 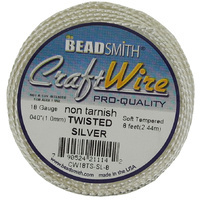 Be cautious, because too much bending will harden the wire to the point that it becomes brittle and it will break.